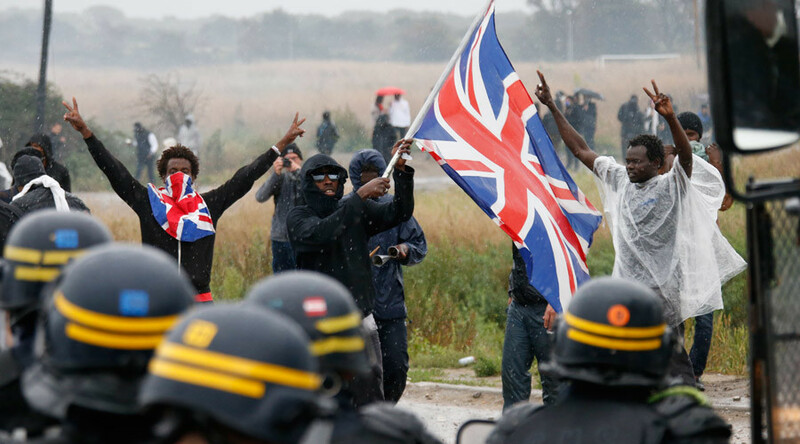 If refugees want to go to England the decision should be made to let them because it is a problem of the British government, said Claude Rochet, Professor, Versailles Saint-Quentin-en-Yvelines University. Pierre Schweitzer, political analyst, also joins. 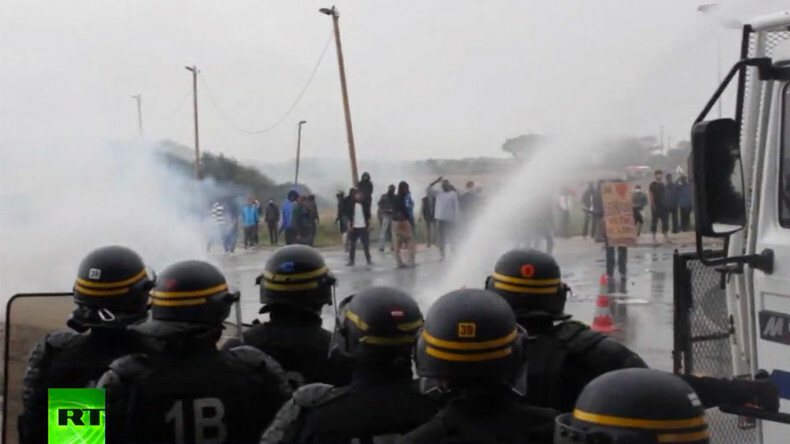 Police on Saturday used water cannon to disperse pro-migrant protesters in the French port town of Calais. The outbreak comes after authorities banned all rallies over fears they could trigger further unrest. Several demonstrators, as well as police officers, were reportedly injured during the march. RT: Do you think the plan to relocate migrants from Calais to other centers across the country will solve the problem? Pierre Schweitzer: There is no good solution here. No matter what we think of the long-term solution we also have to think of those people who live there in Calais and things are getting pretty ugly with truck drivers being attacked, fields being ravaged. I know that it is probably not the migrants’ fault. They are just struggling to make it to where they think they will have a better life. But for the people living there it is also a very tough situation to handle. If we’d share the burden with other regions of the country – we have a country with 23 regions, which have been reduced to 13, but they are still the same size. There are probably a lot of places where they could be relocated. So it is not long-term solution, but it could ease the burden and stop this camp, where very ugly things are happening. — RT (@RT_com) 1 октября 2016 г.
RT: Some experts say that this situation will elevate the problem to a degree, but is it really all about processing the applications of these migrants more quickly? With the sheer numbers of people coming to France, how feasible is that? PS: It is really feasible to ease the administrative process behind that. It is a paradox: it is not mainly France’s problem, it is the UK’s problem, because the majority of these people want to make it to the UK. With the Brexit that recently happened this could probably change the way things could be handled in terms of border between France and the UK, and that started the whole debate in France. And with the presidential election coming, it will probably be a major topic – how we handle that with the UK. If they want to go to England it would the decision that should be made – let them go in England, because it is a problem of the British government. That is why British government pays French government to manage the issue. If it is not fare for us and for the inhabitants of Calais… We need to cut the flow of immigrants from the source. If you cut the flow of immigrants, the flow will stop. If you cut this process of helping the migrants, if you can cut the hope to go through England, the flow will stop. If they have hope to cross the Channel, they will come. And it you dismantle the ‘jungle’, they will reconstruct another one. - Claude Rochet, Professor, Versailles Saint-Quentin-en-Yvelines University, told RT. RT: Should the UK take more responsibility for migrants in Calais? Can you really see the UK agreeing to change the policy that has being signed? PS: I don’t know exactly how it works in terms of European rules. In terms of law, how things could be handled. But yes, there will be pressure on the UK. They voted for Brexit, but now it sounds like they don’t really want to leave the EU. Something could be worked out here trying maybe to ease their leaving of the EU, or maybe accept that they don’t leave the EU in exchange for taking more responsibility for the situation. I should mention at this point that they are paying for security measures in Calais. It is a help, but it doesn’t really solve the matter. So I think it is natural that their border should be on their coast, or at least on their side of the tunnel. I don’t know how this could work out, but something better has to be found here.